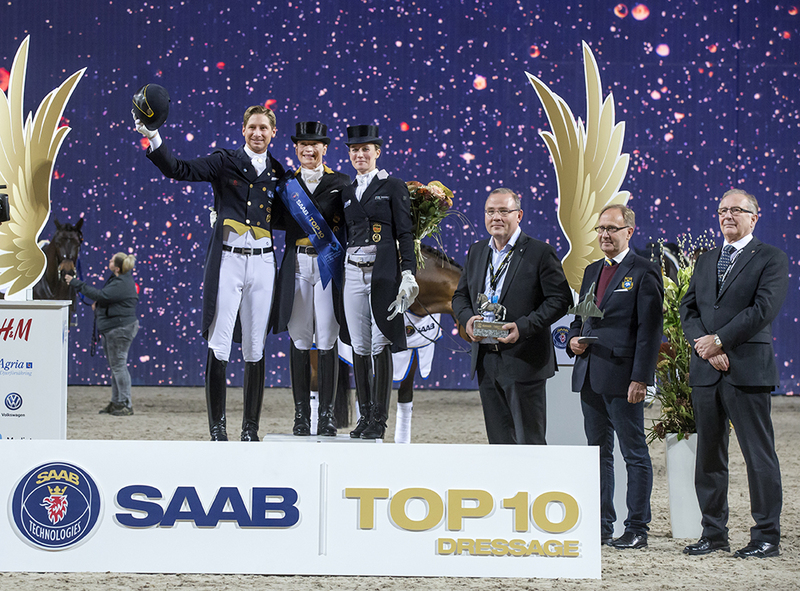 The very first champion of Saab Top 10 Dressage has been crowned. It is Isabell Werth (GER) with Emilio 107 on 86,875%. Runner up is Sweden’s Patrik Kittel and his mare Deja on 83,000% and in third place Helen Langehanenberg (GER) and Damsey FRH on 82,665%. Helen Langehanenberg is riding 15-year-old Damsey FRH, a horse she has only had since 2016. The horse has, despite his age, developed a lot the past year and during the program he is light in his movements, calm, secure and safe. Langehanenberg pulls off a really nice show with a refreshing test for the audience. With a personal best of 82,665% she really sets the pressure of the three riders left in the final. – I don’t know what I could have done better. I’m ending up third today, I hadn’t really expect that. I love doing the freestyle and the horse was just perfect! I’m going home very happy after today’s show and will go to sleep with a smile tonight! Isabell Werth, with 11-year-old Emilio 107, went into the arena directly after Helen’s super test. Isabell and Emilio gave the audience and judges a very relaxed impression – well balanced in the extensions and easy back in collections. Emilio is still a young horse but has the advantage of having a champion in the saddle. With a fantastic show they also pulls off a personal best together with 86,875%. – I am really proud and it’s an honor to be the very first champion of Saab Top 10 Dressage. We, as riders, are so happy that we in Saab found a sponsor that supports us in this final, the whole package is perfect! – The way Emilio did it today was perfect, it’s not easy to warm up here, there is a lot to see and hear. I’m very happy with this weekend. It’s something special with this audience here in Stockholm, they have the exact feeling of when they can clap or not and this gave us just a super finish, says Isabell Werth. – There are many challenges in our program between collection and extension, for example from extended canter back to pirouette. Patrik Kittel and Deja, a 13-year-old Swedish warmblood, was just on fire today! Deja was super easy and light, well in balance and there was so much harmony between the two during the test. The two finished at 83,000%, also a personal best for this equipage. – Deja is a very soft horse with a heart of gold. For me today it was so much power in everything, from audience, to judges, horses and riders, says Patrik Kittel. – Deja did some really good piaffes in the ring today; the test was just flowing for us. -The coolest thing for me was that when you work with something for a very long time and it comes out like this, like all I have been hoping for… It is really a very good day at the office! says Kittel. During the competition a world record was set in spectator judging. Over 900 people in the audience used the app where you can do your own judging of the riders. – The audience here at Sweden International Horse Show is really interested in the sport and has a high knowledge. It is quite close between the spectator’s scores and the judges’. I think that is a good way to interact with the people in the arena and is something we have to work more with in the future, says Kittel. Best in show dressage: Isabell Werth (GER) wins a Volkswagen Tiguan.